The Spanish Steps definitely has to be one of the most beautiful meeting points in the Eternal City. 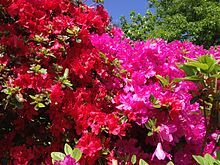 The best time to see them is in May, when the Spanish steps are decorated with pink Azaleas. Here are ten facts about the Spanish Steps. 1. In the piazza, beside the steps, on the right, is the house where English poet John Keats lived and died in 1821. It is now a museum dedicated to his memory, full of memorabilia of the English Romantic generation. 2. In the piazza at the bottom of the Spanish Steps is the 17th century Fountain of the Old Boat (Fontana della Barcaccia), spouting water as she sinks. This fountain, by Pietro and Gian Lorenzo Bernini, supposedly marks the place where a large barge came to rest when the River Tiber overflowed its banks. 4. Audrey Hepburn shared a gelato with Gregory Peck in a scene from the 1954 must see movie, Roman Holiday. 5. The stairway itself is of 138 steps, if you cannot manage this there is a lift, part of the Metro complex. 7. On the 20th March, 1986, the first McDonalds restaurant in Italy was opened near the Spanish Steps. Protests there against fast food led to Carlo Petrini founding the international Slow Food movement three years later. 8. Who designed them? The stairway was designed by architects Francesco de Sanctis and Alessandro Specchi, following a competition in 1717 to find the best designs. 9. At the top the stairway ramp up the Pincio which is the Pincian Hill. From the top of the steps the Villa Medici can be reached. 10. Why are they called the Spanish steps? The steps were built with French diplomat Étienne Gueffier’s bequeathed funds of 20,000 scudi in 1723–1725, linking the Bourbon Spanish Embassy, and the Trinità dei Monti church that was under the patronage of the Bourbon kings of France. 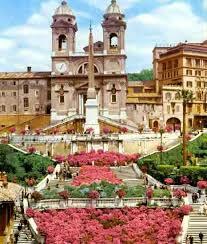 It is this link with the Spanish Embassy, where the name Spanish Steps derives. Italy’s Best Baroque Tour focuses on Rome’s best beautiful Baroque monuments, and the Spanish steps is one of them.